The fact that Google Chrome is sending information about anything that the user types into the Google Chrome Omnibox seems to have caused quite a stir on the Internet with reports about how to disable that "feature" being posted on every blog and website that publishes Internet news. What it basically does is to send the user input to a Google service that is analyzing it and sending suggestions back. While this could be an interesting feature for some users who love to explore new websites it also made quite a few users uncomfortable in knowing that Google would get all that user input delivered on a golden platter. Internet Explorer 8 is making use of exactly the same feature that is automatically suggesting websites based on the previous input of the user. 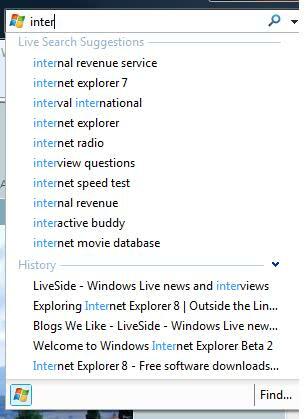 The suggested sites setting in Internet Explorer 8 reports the user's browsing history to Microsoft who in turn sends recommended sites back to the user. While this might be an interesting feature it will raise the same alarm bells that are still ringing from Google Chrome's data collection hunger. (Google admitted to store 2% of the data with IP addresses, no word on how Microsoft intends to use or store the data). Turning that feature off in Internet Explorer 8 is fortunately as easy as turning it off In Google Chrome. Users simply have to click on Tools > Suggested Sites to turn if off (or on if it is turned off and the feature is wanted). 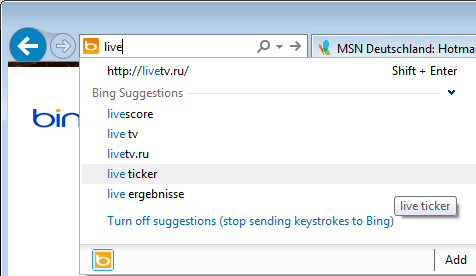 Update: It appears that the feature has been renamed to Bing Suggestions. It appears to be disabled by default and needs to be activated. You can click on the turn on or turn off suggestions feature right in the web browser's address bar. 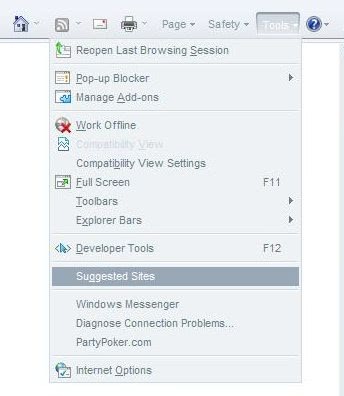 On my copy of IE8 (Ver 8.0.6001.18241), Suggested Sites is not in the top Tools menu. It’s in Tools/InternetOptions/Advanced/Browsing. I found your Tools menu that has Suggested Sites in the first drop-down list. You are using the menu on the Command Bar. I was using the menu on the Menu Bar. Your suggestions are only partially right. True, you have to disable “Enable suggested sites”,under “Advanced Options”, but you ALSO have to disable the auto-complete in: “Tools / Internet Options / Content / Settings “: and under “Use auto complete for”: click off the squares or bars for : “Address Bar” and “Favorites” as well as “Forms” and “User names” and “Passwords”, as well as the tab for “Delete autocomplete history”. That will work! 100 % ! You can also use a variety of programs that can do this for you automatically. This is especially useful when everything gets saved to the cloud if you happen to be logged into an email account while browsing.